Lexington's Rock the Spectrum Autism Family Fun Day is set for Saturday, March 24 from 1-4! This awesome event features Autism Movement Therapy, Music, Sensory Activities, a Bounce House and more! See the flyer below for more information! Our Vanderbilt Parent Stress Intervention Program is back! The next session begins on March 8! For more information, see the flyer below or call Family Services at (518) 773-2014! Flame, Lexington’s world-renowned rock band, will perform a concert for the community on March 16, 2018 at Lexington’s Gloversville facility, 127 East State Street, from 6:30 p.m. to 8:30 p.m. The concert is open the public. Flame will present the concert as Lexington celebrates National Developmental Disabilities Awareness Month. Flame performs around the state and country and last year were the headliners of a concert celebrating abilities in Carpi, Italy, in northern Tuscany. The band performs more than 75 concerts a year, traveling on a specially designed motor coach that has racked up several hundred thousand miles and is due for replacement. Having produced six albums featuring their own music and cover pieces, the band of talented musicians is dedicated to sharing their music and helping people see that everyone has both abilities and disabilities. Celebrating abilities is what motivates the band and makes them sought after as performers. Lexington celebrates National Developmental Disabilities Awareness Month to showcase not only Flame, but the success of many men, women and children with different abilities. Lexington is very proud of the accomplishments of the many individuals whose success in daily life, work, volunteerism, school and college work, and raising families shows how capable they truly are. Flame’s concert is part of this month-long celebration highlighting all that the men and women supported by Lexington do to give back to their community. Tickets for the community concert cost $5 each and are available at Lexington’s Johnstown location, 465 N. Perry Street; Lexington’s Gloversville location, 127 E. State Street; Lexington’s Oppenheim location, 405 County Highway 114, St. Johnsville; the Fulton-Montgomery Regional Chamber of Commerce, 2 N. Main Street, Gloversville; and Mohawk Harvest Cooperative Market, 20 N. Main Street, Gloversville. Tickets will also be available at the door on the day of the event. Audience members are encouraged to bring a non-perishable food item to donate in exchange for the chance to win a door prize. All donated non-perishable food items will benefit local food pantries. Lexington participates in fundraising and food collection throughout the year to benefit a variety of community agencies. Proceeds from this concert will go to the fund to purchase a new Flame tour bus. In addition to the concert, Lexington is sponsoring a poster contest to help raise public awareness for the importance of equality in our society. Students at Fulton County elementary, middle and high schools are welcome to submit art that celebrates equality and differing abilities. This year’s theme is “Together We Have No Limits.” Entries will be judged and top winners chosen from each age group. Winners will receive two free tickets to the Rock for Abilities Concert, where they will be publicly recognized, receive a gift basket and get the opportunity to meet the members of Flame. Top posters will be on display at the Paul Nigra Center for Creative Arts in the Flame recording studio until April 25. In addition, the school with most entries will win a free Flame concert. For information about the contest and how to enter, contact Lynette May at (518) 661-9932 or MayL@lexcenter.org. Entries are due by March 8. 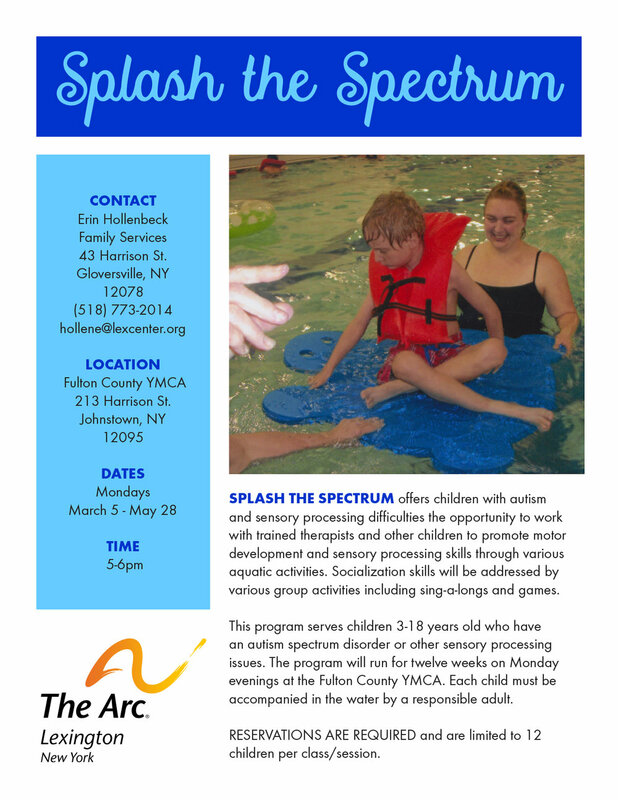 Our Splash the Spectrum Program is back! We hope you can join us! 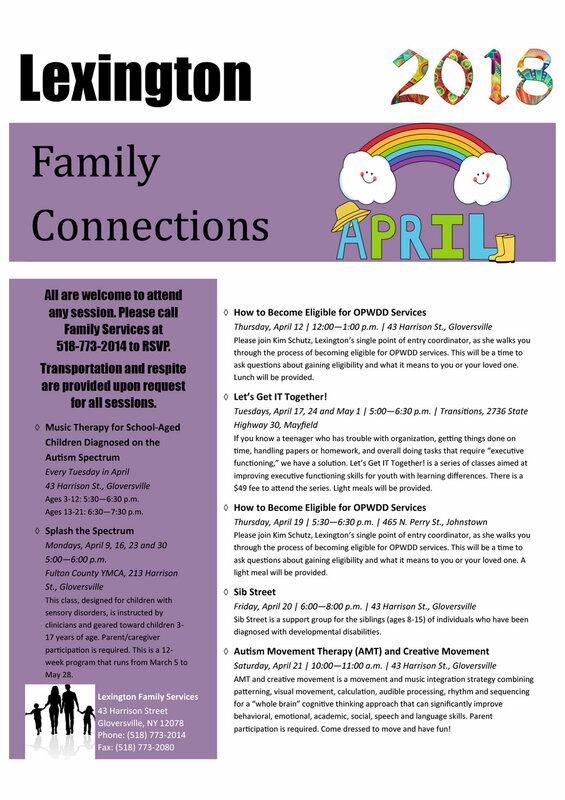 The March Family Connections calendar is here! We hope you can join us for one or more of these exciting events! The band Flame will celebrate the release of their new album, “Christmas Classics,” on Thursday, December 7, with a CD Release Party. The party will take place 6-7:30 p.m. at the Paul Nigra Center for Creative Arts, 2736 State Highway 30, Gloversville. There is no cost for admission. At the party, Flame will perform songs from their new album. Attendees will be the first to have the chance to purchase “Christmas Classics” at a one-time special price of $10. There will also be snacks, raffles, autograph opportunities and more. This is Flame’s sixth album and second Christmas album. “Christmas Classics” and the rest of Flame’s discography are available for purchase at the Nigra Arts Center’s gift shop and online at www.flametheband.com. It is also available for purchase on iTunes, Amazon and CD Baby and for streaming on Spotify, Apple Music, Amazon and Napster. Flame is a ten-piece band comprised entirely of musicians who happen to have disabilities. They formed in 2003 at a talent show put on by Lexington, a chapter of The Arc New York. Flame has a repertoire of more than 100 classic rock, pop, country and blues songs from the past 50 years as well as some original tracks. In the past 14 years, they have produced six albums and a single. They tour the northeastern United States in a custom bus and play more than 70 shows per year. Some of the biggest venues they have played include the Rock and Roll Hall of Fame and the House of Blues in Cleveland, New York City’s Apollo Theater, Harvard Law School, the Greek Ministry of Education building in Athens, Greece, the 2009 Special Olympics World Winter Games in Boise, Idaho, and the 19th International Festival of Different Abilities in Carpi, Italy. Flame has received press from Good Morning America, People magazine, Metroland magazine and the Daily Mainichi News in Tokyo, Japan. For more information about Flame, please visit www.flametheband.com or contact Maria Nestle at (518) 661-9932, ext. 164 or nestlem@lexcenter.org. Flame, a ten-piece band comprised entirely of musicians who happen to have disabilities, will join four other community bands to perform at a radiothon to benefit hurricane victims in Puerto Rico on Thursday, November 30. Flame formed in Gloversville in 2003 at a talent show put on by Lexington, a chapter of The Arc New York. This concert is part of the LIVE-AID: Fulmont for Puerto Rico Taste of the Mohawk Valley and Hurricane Relief Concert at Amsterdam High School, 140 Saratoga Avenue, Amsterdam, NY. Since the community has many direct connections to the areas of Puerto Rico affected by Hurricane Maria, this event is bringing together local businesses, organizations and acts to collect much-needed donations and supplies to assist the relief effort. The evening of food, fun, silent auctions, raffles and live music begins at 5 p.m. with Taste of the Mohawk Valley, a family-friendly event that showcases the food of the region. A variety of vendors will present samples of a wide variety of food favorites. The Hurricane Relief Concert begins at 7 p.m. In addition to Flame, other artists to take the stage include Skeeter Creek, Bronte Roman, Louie and Lisa Velez, and MedRock. Together, they are all preparing an evening of music filled with heart, soul and everything they can give to help and heal. Tickets to the event cost $15-$25 and may be purchased at www.liveaid.eventbrite.com. Flame has a repertoire of more than 100 classic rock, pop, country and blues songs from the past 50 years as well as some original tracks. In the past 14 years, they have produced six albums and a single. They tour the northeastern United States in a custom bus and play more than 70 shows per year. Some of the biggest venues they have played include the Rock and Roll Hall of Fame and the House of Blues in Cleveland, New York City’s Apollo Theater, Harvard Law School, the Greek Ministry of Education building in Athens, Greece, the 2009 Special Olympics World Winter Games in Boise, Idaho, and the 19th International Festival of Different Abilities in Carpi, Italy. Flame has received press from Good Morning America, People magazine, Metroland magazine and the Daily Mainichi News in Tokyo, Japan. Lexington, Chapter of The Arc New York, will hold its 23rd Annual Family Services Conference on Tuesday, November 14, from 8 a.m. to 4 p.m. at 465 N. Perry Street, Johnstown. The conference will feature several guest speakers presenting on a variety of topics about parenting and supporting young people with differences. It will begin with opening remarks from Assemblyman Marc Butler of New York State’s 113th District. After that, Shaun Evans, DPT, will give the keynote presentation, titled “Dream BIG … ANYTHING is Possible.” Evans is the Vice President of Education at Ainsley’s Angels of America Foundation. He will share his family’s story of extreme persistence, love and togetherness as they supported his oldest son’s dream of running across the USA, 3,200 miles in 60 days, despite being born with cerebral palsy. Concurrent breakout sessions will follow the keynote presentation. Tina Beauparlant of Parent to Parent of NYS will present “Planning for a Successful Transition from High School to Achieve Your Child’s Dream.” She will share a parent’s perspective on how to help your child have a successful transition from high school while supporting their dreams. Joy Stockwell, who has worked for OPWDD for 30 years as a direct support professional, Self-Direction professional and Self-Direction liaison for the Capital District, will present “Exploring Self-Direction.” Her presentation will offer insight on the OPWDD Self-Direction program, which offers people who are eligible for OPWDD services the flexibility to choose the mix of supports and services that are right for them and let them live the life they want. After lunch, Keith McCauley, Region III Deputy Director of OPWDD, will give a keynote address, in which he will provide updates from the past year at OPWDD. Two more concurrent breakout sessions will follow. Renee Carr will present “Mental Health and Wellness.” Carr is the Coordinator of Education and Information-Referral Services as well as a certified mental health first aid instructor at the Mental Health Association in Fulton and Montgomery Counties. Her presentation will provide an overview of mental health-related diagnoses. It will incorporate tools to help manage some of the symptoms related to mental illness and provide a better understanding of their impact on one’s wellness. Dr. Kristin Knapp-Ines, a licensed clinical psychologist and board-certified behavior analyst (BCBA-D) who regularly conducts trainings, presentations and workshops at the Center for Autism and Related Disorders (CARD), will present “Supporting Individuals with ASD to Meet Their Full Potential in Meaningful Employment.” This training will briefly describe the definition, characteristics and misconceptions that are common to individuals with ASD, some of the challenges they may face in the workplace due to social deficits, and suggestions and tips for working with individuals with ASD in the workplace so that they may reach their full potential. Attending any two sessions will qualify an attendee for one FET annual required training, which allows people to maintain their status in the Home and Community Based Medicaid Waiver Service. There is no cost to attend for individuals with disabilities or their parents and families. For professionals, the cost is $75. 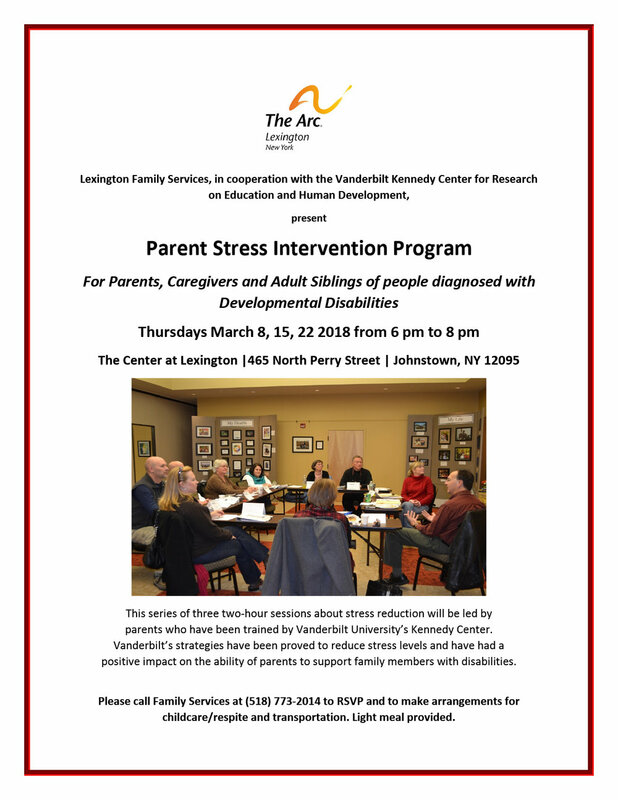 For more information, to register or to arrange for transportation and respite/childcare, please call Lexington Family Services at (518) 773-2014. Attendees may pay at the door or mail registration and payment to Lexington Family Services at 43 Harrison Street, Gloversville, NY 12078. Artists from Lexington’s Creative Expressions program and the Transitions program will be featured in a Sacandaga Valley Arts Network (SVAN) art show at the Northville Library Gallery, located at 341 S. Third Street, Northville. The show will run from October 31 to December 28, 2017. The public is welcome to attend a Meet the Artists reception on Tuesday, November 14, from 6-8 p.m. The show features collaborative splatter paintings based on the work of Jackson Pollock, a 20th century American painter who helped pioneer the abstract expressionism movement of spontaneous, emotional, abstracted art. The Transitions students were inspired to research and study the movement and Pollock’s technique after a docent-led tour of the Munson-Williams-Proctor Arts Institute in Utica, where they saw original pieces by Pollock and many of his peers. The artists who collaborated on the Creative Expressions piece include Bobby Carr, Richard Freeman, Dennis Hoyer, Caroline Pendlebury, Adrienne Phillips, Thelma Senecal, Taylor Skinner, Debbie Woodruff and Mikyle Woodward. The artists who collaborated on the Transitions piece include Zen Anderson, Lacy Brower, Maria Bucholtz, Greg Clicquennoi, Josh Corbett, Olivia Esposito, Joe Magliocca, Eric Noonan, Noah Pappas, Maggie Roarke, Marybeth Sefcovic, Bethany Sweet and Kristen Troy. The Northville Library Gallery is open to the public Monday, Friday and Saturday 9 a.m. to noon; Tuesday 9 a.m. to 8 p.m.; and Wednesday and Thursday 9 a.m. to 4 p.m. The gallery is free of admission. Visitwww.svanarts.org or call the gallery at (518) 863-6922 for more information about this show. Lexington’s Creative Expressions program is committed to creating inspired living through the arts. The program promotes independence and choice through outcome-based programs and involvement in the community. Goals focus on social activity, creativity, talent, choice, exercise, self-worth, skill-building, and health and wellness awareness. Creative Expressions artists have participated in many local exhibitions, won several prestigious awards and sold more than 100 pieces of art. For more information about Creative Expressions, call Lexington at (518) 773-7931 or visit www.lexingtoncenter.org. Transitions is an apprenticeship program that supports young adults with learning differences ages 18-27 as they attend college, get their first jobs and live independently for the first time. Its innovative curriculum covers social skills, health and wellness, independent life, self-management, and self-advocacy and leadership. The program also offers career success and exploration classes, coordinates internships in local businesses and provides job coaching and mentorship opportunities. For more information about this unique program, visit www.transitionsusa.org or call (518) 775-5384. The Lexington Foundation’s NIGHT OUT will take place at the Paul Nigra Center for Creative Arts on Friday, September 22. The event begins at 6 p.m. The arts center is located at 2736 State Highway 30, Gloversville. 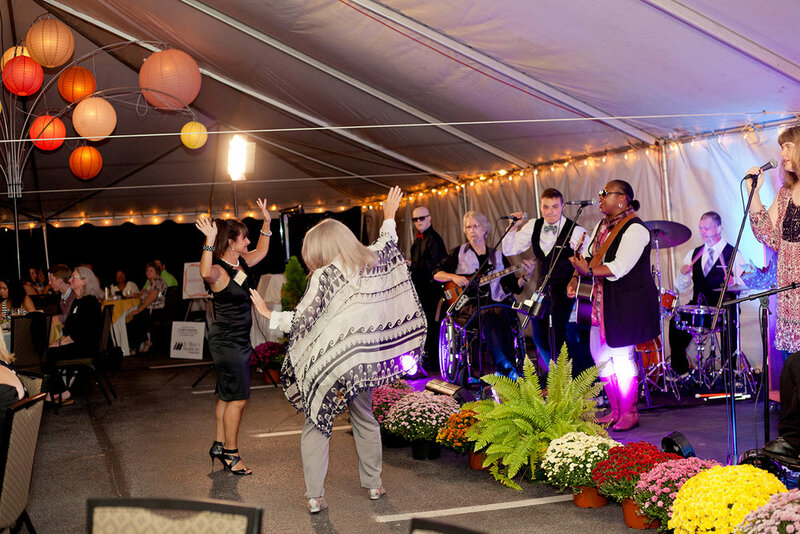 The NIGHT OUT will feature food and craft beer from Lanzi’s on the Lake, musical performances by Pat Decker and Flame, raffles and auctions, magician Shaun Robison, dancing and much more. Proceeds will benefit the Nigra Arts Center and Transitions. The Paul Nigra Center for Creative Arts is upstate New York's premier community arts center, providing classes in music, dance, art, yoga, cooking and more. The center houses exceptional art venues, hosts family fun events, and provides educational opportunities for people of all ages, abilities and artistic skills. Additionally, the Nigra Arts Center is a popular venue for private and corporate events. Transitions is making a difference in the lives of young people and families by providing the training and skills needed for students to live independently and follow their college and career dreams. This outstanding college and career Apprenticeship program is uniquely designed for young adults with autism spectrum disorders, ADHD, nonverbal learning disabilities and other learning differences. Individual tickets for the NIGHT OUT are $100. Tables for 10 and sponsorships are also available. For more information, visit pncreativeartscenter.org or call (518) 661-9932. Lexington - Fulton County Chapter of NYSARC, Inc., was proud to join John Robinson, CEO of Our Ability, Inc., on July 5, Day 9 of his fifth annual Journey Along the Erie Canal. Riders from Lexington have participated in a portion of this event every year, and their group has grown each year. This time, 25 riders and support team members from Lexington biked more than 34 miles from Little Falls to Amsterdam. They raised $250 to support the efforts of Our Ability. The Journey Along the Erie Canal is 12-day bike ride along the Erie Canalway that aims to increase awareness for the benefit of employment for all New Yorkers, promote Our Ability’s New York Business Leadership Network, a coalition among businesses in New York State interested in hiring people with disabilities and supporting businesses owned by people with disabilities, and raise funds toward building employment opportunities and empowering people with disabilities. The 2017 Journey also celebrated the Bicentennial of the Erie Canal. Our Ability is a business dedicated to building employment opportunities through job platforms, employment webinars, a digital profile system and personal empowerment. Robinson is a 2014 White House Champion of Change and the author of “Get Off Your Knees: A Story of Faith, Courage, and Determination.” For more information, visit www.ourability.com. To celebrate National Developmental Disabilities Awareness Month, Flame, Lexington’s world-renowned rock band, will perform a “Rock for Abilities” concert on March 31, 2017. It will be held at Lexington’s Gloversville facility located at 127 East State Street from 6:00 p.m. to 8:00 p.m. Tickets cost $5.00 each and are available at Lexington’s Johnstown, Gloversville and Oppenheim locations, the Paul Nigra Center for Creative Arts, the Fulton Montgomery Regional Chamber of Commerce and Mohawk Harvest Cooperative Market. Tickets will also be available at the door on the day of the event. Audience members are encouraged to bring a non-perishable food item to donate in exchange for the chance to win a door prize. This concert is part of the Lexington Gives Back initiative and all donated non-perishable food items will benefit local food pantries. Previous concerts have collected hundreds of pounds of non-perishable food items. Hundreds of Lexington employees, program participants and family members have helped make the projects such a success. Lexington participates in fundraising and food collection throughout the year to benefit a variety of community agencies. The proceeds from the concert will go to fund Flame’s new recording studio at the Paul Nigra Center for Creative Arts, a year-round arts center that provides classes, exhibitions, entertainment and special events to people of all ages and abilities. The arts center serves as Flame’s “home base.” Money from the concert will go toward buying new instruments and equipment and recording new music at the studio. To accompany the concert, Lexington is sponsoring a poster contest about attitudes toward people with disabilities. The contest is open to students at Fulton County elementary, middle and high school students. Winners will have their work displayed at the Paul Nigra Center for Creative Arts’ Fulton Montgomery Counties Art Show, which runs May 5 to June 5. For more information about the concert or the poster contest, please contact Maria Nestle, Flame’s manager, at (518) 661-9932, ext. 164 or nestlem@lexcenter.org.